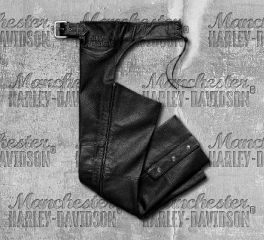 Harley-Davidson leather motorcycle riding pants and chaps are one part protection from wind, debris and abrasion, one part classic biker swagger. 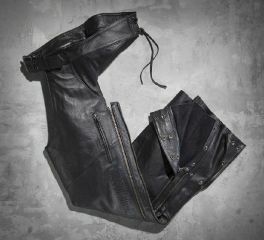 Light and mid-weight motorcycle chaps give you more freedom of movement with plenty of iconic style. 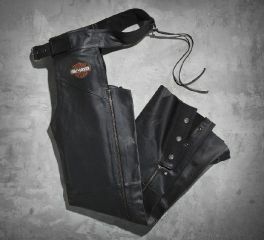 The Men's Deluxe Leather Chap is an iconic basic of the Harley-Davidson® wardrobe. 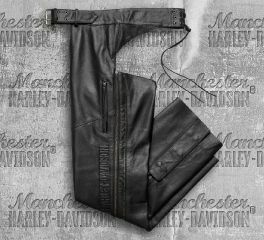 Men's Black Stock II Leather Chaps features a buckle closure and back lacing. Zipper leg with three snaps, and an embroidered graphic on left hip. 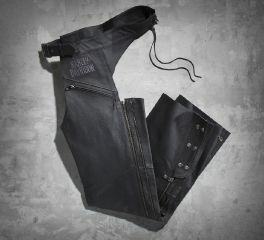 The Men's Tradition Leather Chap is an iconic basic of the Harley-Davidson® wardrobe.